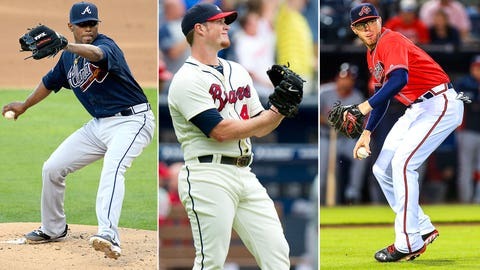 Julio Teheran (14-8, 3.20 ERA last year -- far left), Craig Kimbrel (50 saves, 1.21 ERA) and Freddie Freeman (23 catches, 109 RBI, .319 BA) are all primed for big seasons in 2014. The Braves launch full-squad workouts for spring training four weeks from today (Feb. 18 at the Walt Disney World complex in Kissimmee, Fla.). 3. The Braves play every team from the National League East in April … but see only the Marlins — twice — in May. 5. With the notable exception of Memorial Day and Labor Day (1:10 p.m. start times), every midweek matinee at Turner Field has a start time of 12:10 p.m.
7. The Braves have at least one 10-game homestand for July, August and September. By comparison, the Nationals have just one 10-game homestand during that span (Aug. 15-24 — Pirates, Diamondbacks, Giants). 8. The Braves don’t have any West Coast trips after Aug. 6 … which is odd since the NL East, for the most part, takes on the American League West in Interleague play this season. 9. For May 26-29, all 30 MLB teams will partake in an extended series with an Interlague rival, split between two cities. The Braves’ partner in this experiment (second straight year) will be the Red Sox — starting in Atlanta (May 26-27) and ending in Boston (May 28-29). 11. The Pirates, the reigning NL Central champions, don’t visit Turner Field until the final week of the regular season (Sept. 22-25).